MicroRNAs (miRNAs) are small non-coding RNAs with roles in plant development and stress responses. Loss-of-function analysis of miRNA genes has been challenging due to the lack of suitable knockout tools. 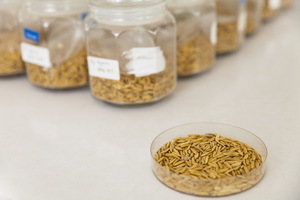 A team of scientists from various universities, led by Jian-Ping Zhou from the University of Electronic Science and Technology of China, aim to study miRNA genes, specifically OsMIR528, in rice using CRISPR-Cas9. Frequencies of mutants T0 lines ranged from 48% to 89% at all target sites. Three independent guide RNAs (gRNAs) all generated biallelic mutations among mutant lines. This demonstrates that CRISPR-Cas9 is an effective tool for knocking out plant miRNAs. However, single-base pair (bp) mutations in mature miRNA regions were found to lead to the generation of functionally redundant miRNAs, while large deletions were found to abolish miRNA function. Analysis found that OsMIR528 is a positive regulator of salt stress. This work provides guidelines on targeting miRNAs with CRISPR-Cas9 and also brings new insights into miRNA function in rice. For more information, read the article in Frontiers in Plant Science.